From Vancouver Island we drove quickly to Mount Robson Provincial Park. On the way we stayed one night on a nice parking lot Blue River on highway 5 (GPS coordinates: N52° 13.488' W119° 13.091') where we saw some cute animals. In the morning we realized that some trees were burning close to the rest area. Fortunately the wind came from the opposite direction. It was cold, foggy and started raining when we came to Mount Robson Provincial Park. There is an interesting visitor center with beautiful images of the highest peak of the Canadian Rockies, but we could not catch a view of this giant mountain. Thus we continued to the wonderful Miette Hot Springs in the Jasper National Park, where we enjoyed the pleasant warm water. Fortunately it was raining cats and dogs on the next two days and the wildfires subsides. We spent these two days in the little town Hinton where we could stay the nights on the parking lot of the supermarket Freson Bros (GPS coordinates: N53° 23.470' W117° 36.712'). There is a superb recreation area in Hinton which offers a swimming pool including sauna, indoor climbing and other activities for little money. In addition we saw cute animals, too. 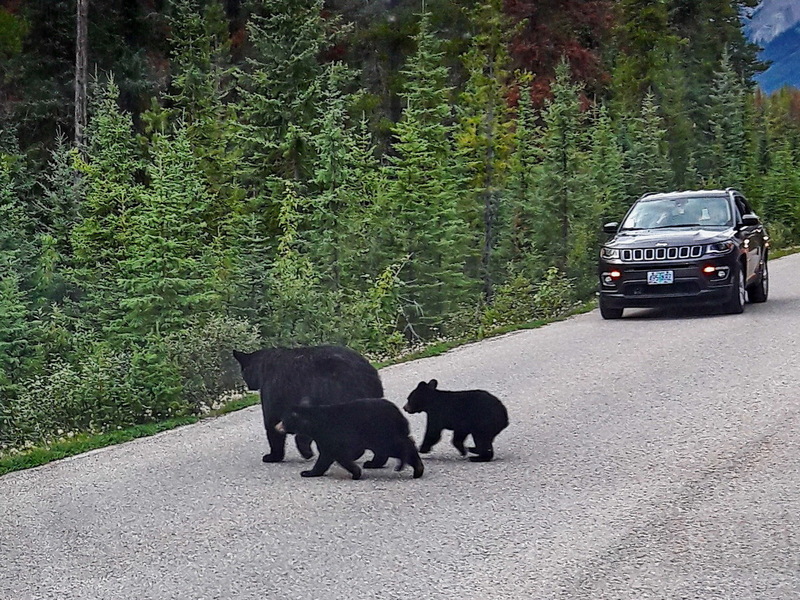 Again we saw stunning wildlife on the street to Maligne Lake. Jay and Kuba were very brave because they jumped into the ice-cold water Maligne Lake at 1,700 meters sea-level. Nice but smaller hikes were Maligne Canyon and Moose Lake where we could not detect any Moose. The Bears were incredible. They strolled around our cars for several minutes. Our kids were so excited, also on our the next day. Fully equipped with crampons, ice-axes and rope we climbed up several hundred meters the huge glacier Columbia Icefield. Rosemarie, Jay and Kuba were the first time on a glacier and they were so proud! We left Jasper / Banff National on highway 11, where we stayed a calm night close to the entrance on the Kiska / Wilsson public land zone (GPS coordinates: N52° 00.906' W116° 36.932'). Few kilometers east are the marvelous Siffleur Falls, which is a longer hike of 3 to 4 hours roundtrip. Thanks to the heavy rain few days ago we dared to camp in the wilderness of Cline River with our kids. Making fire was permitted again. With huge backpacks we walked 7.5 kilometers along Cline river to a nice place where we stayed the night in tents and where we found an extraordinary surprise. There is a good and free place to stay the night with a motor-home on the trailhead of Cline River (GPS coordinates: N52° 10.025' W116° 28.671'). Our trails of the hikes Cline River and Siffleur are included in the GPS coordinates file of Alberta. We left the Rocky Mountains and headed to the badlands northeast of Calgary which are famous for Dinosaurs. Marvelous is the hike into the Horse Thief Canyon. On the trailhead we stayed the night free (GPS coordinates: N51° 32.279' W112° 52.196'). Outstanding is the Royal Tyrrell Museum northwest of the little town of Drumheller which shows a lot of Dinosaurs. Finally we visited the Atlas Coal Mine southeast of Drumheller. Remarkable was the ride on a little train where Rosemarie was the assistant of the driver. Sadly our guests had to leave in the evening of September 5th 2018. Before we drove to the airport we visited the swimming pools in the recreation center Genesis Place of Airdrie. The kids had a lot of fun, especially with a tough climbing wall over a pool. Without kids we returned to Banff National Park to hike a little bit. Firstly we explored Johnston Canyon including its stunning ink pots. 3127 meters high Observation Peak was Marion's birthday present - a long strenuous day hike from the saddle north of Lake Louise. Moraine Lake and Consolation Lakes are beautiful places close to Lake Louise. Finally we wanted to climb up Storm Mountain from Vermillion Pass but the weather was too ugly. Instead we visited Marble Canyon and Orche Beds in the rain. Before we came back to Calgary we circled the Canadian Rocky Mountains on a southern loop via Crowsnest Pass. Radium Hot Springs are nice and not expensive but the natural and free Lussier Hot Springs are even better. Overnight parking is prohibited in front of the Lussier Hot Springs but we found a good place few hundred meters southwest (GPS coordinates: N50° 07.585' W115° 36.836'). Also few kilometers west of the Radium Hot Springs is a nice place with wonderful views into the valley of Columbia River (GPS coordinates: N50° 37.934' W116° 06.920'). Before we drove back to Calgary we visited Fort Steele. It was cold and snowy when we arrived in Calgary. There we found two more pleasant overnight places in its southwest corner - Grey Eagle Resort & Casino (GPS coordinates: N51° 00.451' W114° 08.833') and Weaselhead Parking (GPS coordinates: N50° 59.651' W114° 08.506'). Calgary Secure RV Storage is a great place to store the RV for longer time. Its owner David Blake Reid is very friendly and helpful. On September 18th 2018 we left Calgary for several month to see our family and friends in Germany. H5cmerzlich wünschen wir Euch weiterhin alles Gute und einen perfekten Start in ein perfektes Neues Jahr.